This smaller, lesser known relative of Phormium tenax is one of only two species found in the genus Phormium, and is credited as the parent that gives the graceful arching form to many hybrids. The plant is a native of New Zealand, where it is widely grown for its valuable fiber; hence the name, Phormium, which is Greek for basket. Māori used the leaves of both species for weaving baskets, mats, ropes, clothing, fishing nets and head-bands. Using a sharp mussel, leaves were cut and the fleshy green substance was stripped off down to the fiber. After the fiber (called Muka) was exposed, several more processes of washing, bleaching, dying and drying would yield fibers of various strengths and softness. The handmade flax cording and rope had such great tensile strength that they were used to bind together hollowed-out logs to create ocean-worthy canoes. It was also used to make rigging, sails, roofs for housing, and frayed ends of leaves were fashioned into torches for use at night. Roots yielded materials to make medicine, and nectar and pollen were obtained from the flowers to make face paint. Combining function and form, P. cookianum boasts yellowish-orange flowers on towering spikes that, unlike the vertical flower spikes of P. tenax, angle out from the plant’s crown. The seed pods resemble long black bean pods, and can weigh the inflorescence back nearly to the ground. 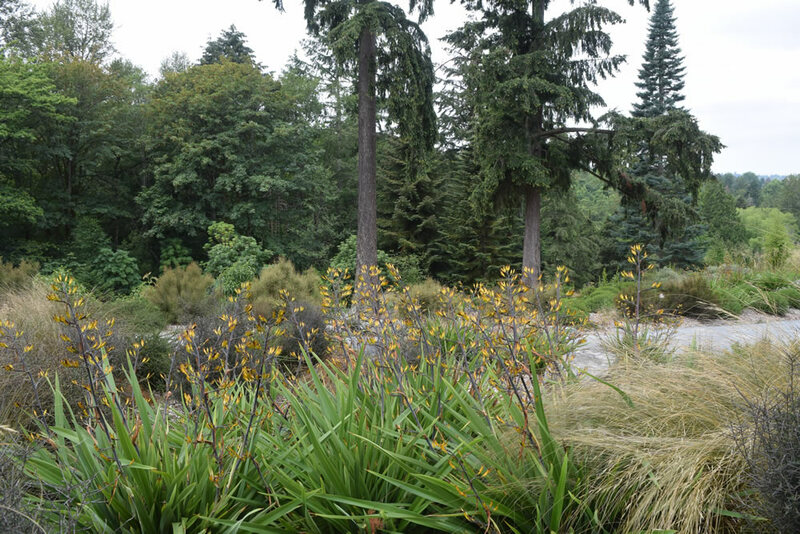 This Phormium can grow in sun or partial shade and will tolerate fairly dry conditions but prefers moderate water. 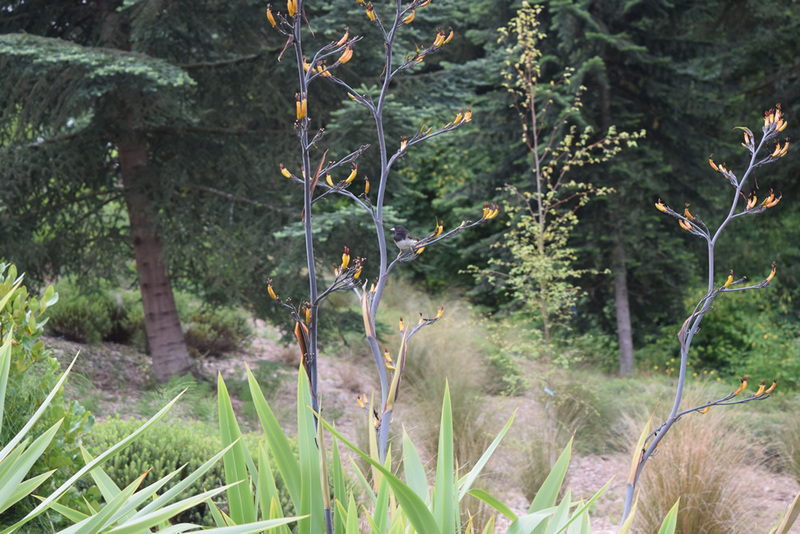 This summer is the first year our Phormium cookianum is blooming here in our nascent New Zealand garden, and the show is not to be missed. 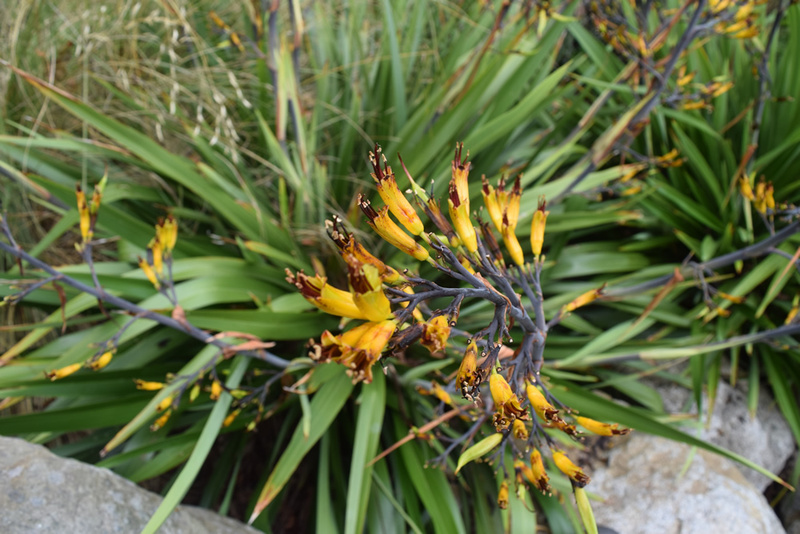 In the United States we mostly use Phormium as a strong architectural element in the garden and a fantastic hummingbird attractor, but in New Zealand this monocot’s connection to the history of a nation cannot be unwoven. Height and Spread: 4-5 feet tall. Mature clumps can be 8-10 feet wide with leaves 2-3 inches wide.